I’ll use the analogy of a balance beam to represent parents helping their children navigate the food world. We coach our kids on how to cross the beam safely without falling off into obesity or eating disorders. When I was growing up in the 1970’s, the beams were fairly wide and it didn’t take much coaching. Some beams were wider than others due to socioeconomics and food access. Some children had better balance due to genetics but most made it across because the beams were wide enough. Those that fell off were the exception and not the norm. Today we see more and more kids falling off and parents working harder and harder to coach them across. I have seen some incredible coaches who have wonderful blogs to help other parents with their children. What I don’t see is enough recognition that the widths of the beams have shrunk considerably over the past few decades. Much of that is due the the food industry and their marketing of junk food to kids. Girls especially face a double whammy with advertising to make them crave both junk food and an unrealistic thin ideal. Even those of us who give our kids little to no junk food have to worry about the billions of dollars spent on food marketing aimed at making them feel deprived if they don’t have a lot. Finding that balance between deprivation and junk food overload is getting tougher and tougher for parents to navigate. We are seeing this with rising rates of both obesity and eating disorders. Instead of putting all the blame on parents when children fall off the beam, why aren’t we looking at how much the degree of difficulty has increased and the reasons for it? Tags: Fed Up. Bookmark the permalink. I, for one, am definitely fed up. I’m tired of being made out as the ‘bad guy’ because I don’t allow my children to gorge themselves on sugar and processed foods. My children understand the importance of what they put in their body and understand the need to limit sugar, but they no doubt still feel deprived because of all the media attention given to the ‘bad’ things. To add to that, they see their peers eating these items at school and when we go out and it just makes it that much more difficult. It’s also hard for them not to judge the other children because they know what they’re eating is bad for them. Perhaps the government and media could take notes from a 3- and 6-year old who clearly know more about proper eating habits than they do! Thank you and glad to hear I’m not the only one. I think I might be in love with John Oliver now. Thanks! I wonder if John Oliver knows how happy he’s made mothers like us with that segment. Great article, completely agree with you. I also struggle with perceptions that I am “depriving” my children because we follow a healthy diet and don’t allow them to have junk food (come on’ they are 3 and 20months!). It is not as bad here in the Netherlands but still that push for junk food is strong on children (and us!). Thanks for you comment and it’s good to hear the perspective from someone outside the U.S. about this. And children aren’t the only targets. Too many retail venues that have nothing to do with food offer sweets near the cash register. Almost every conference exhibit hall is an endless aisle of temptation–even ones targeting health and health professionals. We live in a culture of indulgence, all the while wanting to believe that it is possible to be thin enough to “get away with it”. I appreciate the support. I’ve already read it, have it printed, and am ready to present it the next visit to my son’s school! Great and please let me know how it goes. Great post – and the John Oliver clip is SO good! Laughing out loud right now. 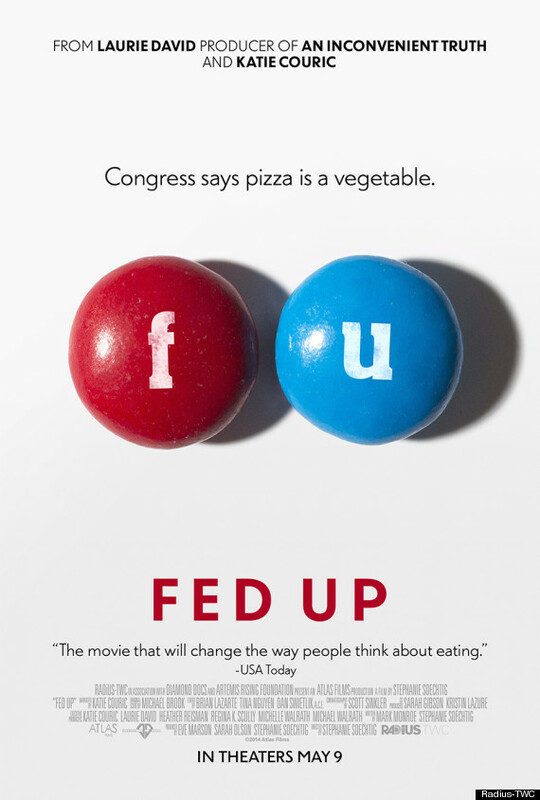 Also can’t wait to see Fed Up! Yes and if just watching the trailer get me this fired up, what will it be like after I see the entire movie? I’m Fed Up too! Great post! First off I am all for healthy eating and I firmly believe our nation has a health epidemic on its hands. I think that in our current culture we put off today what can be done tomorrow we pass the buck and the blame. Why are parents afraid to tell their children NO, yeah it stinks they are not going to be happy with you. But you are protecting them its your job! Providing a better future for your children should be your prime motivator behind everything you do. Both of you ladies use phrases like “I don’t want my children to feel deprived” and “I don’t want to be the bad guy”. The later statement is the most true parents do not want to be the bad guy it is easier to pass the buck on to someone else than to realize responsibility. You scream of over exposure to media but you put the cell phone in their hands you put a TV in every room and a computer in their bedroom. The media did not do this to children parents did. TV production companies are not babysitting the nations children for free that is not how reality works. Really think about this who is more guilty marketers or the parents who abandon their children unsupervised in front of the TV I mean really you can’t pop in a dvd. This is typical story in America little Johnny comes home to a basically unsupervised home because mom or dad are too busy playing Facebook. He sits in his room from 4pm to 11pm playing Call of Duty, watching cartoons and 200 channels of Cable, and talking on his cell phone and internet. Little Johnny might come out once to eat some McDonalds one of his parents brought home because he asked for it after watching a commercial. You’re mad that his meal had a sugary soda I am just glad the kid got to eat something. If you think that a Clown or a Burger King has been the downfall of childrens health you are delirious. Cindy we grew up in the same time frame it isn’t all about the food, I played outside with my two brothers and the neighborhood kids. We played literally all day long we ran we climbed we biked and swam our hearts out. We come home long enough to get breakfast lunch and dinner. Mom and Dad monitored everything we consumed what we watched on TV what we read, who we hung out with and they had no problem telling us no. If I would have locked myself in my room for 6+ hours a night playing video games my parents would have had me seen by a psychologist and tested for drugs. The only Playstation I had was the jungle gym at the city park and when I did get a gaming system I was not allowed to play it non stop for days on end. Maybe today’s kids would be healthier if they got a little exercise and played outside. So while you’re worried about fast food, I see other solvable problems first off how insane is it to give a school age mind the unfettered mess of information that we call the internet not to mention all the junk thats on cable TV. With all of the poison and crap floating out there you’re lucky if its Ronald McDonald that grabs your kids attention. What about the other food Johnny consumed that day school, do a little bit of internet research and you will find hungry high school students and story after story of unsafe food in school cafeterias. Fast food places test their food and sanitation 5 to 10 times more than the USDA recommends therefore 5 to 10 times more than the food in school lunches. By the way while McDonalds and TacoBell stopped using Ammonium Hydroxide in meat years ago, school lunch programs are using it today. Really after a little googling I am beginning to think McDonalds and Subway care more about kids health than parents and schools. Yes Cindy I blame parents, it is parents that allowed a school lunch program to buy treated meat. Parents expose their kids to marketing and filth by giving them so much unmonitored access to the internet because it keeps them quiet and entertained. Parents take the easy road and avoid guilt by appeasing a childs every want. Grow up if your kid is fat it is your fault, you failed because you didn’t love them enough to stop them from overeating. People need to stop passing the buck and accept responsibility for their own actions. Really why do you think parents buy kids meals at fast food joints if you think the child is making the family’s dining decision you are wrong. Parents buy fast food for kids because they don’t want to take the time away from Facebook to cook their kids a healthy meal. If Ronald is telling kids to get active then what’s wrong with that? If the message is good and positive then who cares about the medium. And frankly if this clown has the pull on children that you believe I am glad he is using his powers for good. America needs to stand up and be accountable actions truly speak louder than words. I applaud you Cindy for standing up for children and trying to provide a better example for children in regards to nutrition but I think that you are misdirected. Parents are in whole responsible for the upbringing of their children. Corporations should not be faulted for making their pitch, people should be faulted for allowing laziness and gluttony to override common sense. You voiced an opinion that I’ve encountered quite often when working to improve the food environment for kids. The message Ronald McDonald delivers does not take place in a vacuum but comes with the baggage of a company spending millions on marketing to make kids want to eat burgers, fries and soda. That’s why I say he is the Joe Camel of Type 2 diabetes. I am grateful to the previous generation of parents who eliminated cigarette marketing to kids and have a duty to pay it forward by addressing the issue of Ronald McDonald using schools to market to kids. I am mom to a child who has very limited access to TV and other media. We have 1 TV in the house and it is rarely on when she is awake, although we have been trying to watch shows like Cosmos. When she is using a cell phone for entertainment (which is rarely) it is to play chess; there are no electronics (other than clock radios) in the bedrooms in the house. She’s been in a McDonald’s once in her life because we couldn’t find another bathroom nearby. Yet, despite our vigilance as parents, she is exposed daily to all manner of junk food. It’s in the lunches and snacks kids at school bring from home. It’s in the rewards given in the classroom by the teacher on at least a weekly basis (often several times per week). It is the basis of the once/week hot lunch program at school. It is the “snack” given out after choir rehearsal, at the beach clean up, at the tree planting event. I am willing to be accountable for my actions. I suffer through the rolled eyes when I have her say “no thank you” to the cookies and fruit flavoured beverages. I provide alternatives to the teacher who consistently reminds me that I am depriving my child. I explain myself the best that I can to other parents. whilst trying not to be critical of their choices. All of these people are sending my daughter a message: “You poor kid – you are really missing out. It’s too bad your parents are so strict.” And because of that I suffer through the frustrations of my child and her feeling that she is being deprived. I wouldn’t mind telling her no from time to time, but almost every day, I am telling somebody “no” when it comes to unhealthy food. Where is the accountability for THEM? Good question and thank you for the comment. Exactly my experience. Parents can’t do this alone. Everyone who touches food and offers food to children is either part of the problem or part of the solution. Frankly, I find it easier to manage food choices at McDonald’s than at school, other people’s homes and most retail and entertainment venues, not to mention sit down restaurants. I appreciate a location where I can order small, medium or large. And no one automatically refills a soda cup, refills the bread, replaces the basket of tortilla chips, or brings desert without asking. I once ordered a cucumber instead of fries for my son at a resort. I was charged $4.99 for the kid’s meal and $5 for the cucumber. I am ready to write the book, “Stop Feeding My Kid”. What a great point Casey! true insight. For what kind of mindset is useful to a parent who wants to feed their children healthy in this hostile food environment I always like the comparison to the mindset of somebody who has an allergy. It has two distinguishing characteristics: Can not assume that anything which surrounds you in your food environment (let it be grocery store, restaurant, vending machine, school lunch, etc) is appropriate for you to eat, and always move in the food environment with a plan of what you will eat next (with some flexibility if you have options) because any accommodation can be made now for tomorrow’s meal but very little accommodation can be made for what to eat right now. I also think that the reason why we came to this stage of affairs is a larger structural issue: food producers are neither moral agents nor set out to provide us with healthy food. They do not even optimize the use of our limited resources according to our collective interest. On the other hand if you look at it from the perspective of the individual: we operate by developing habits based on some level of trust. We trust that when we live in an urban environment and need food we buy it in the grocery store. We trust that what is sold as food will not harm us. It is a shock and a great disappointment when you discover that the brands you habitually bought, came to like and could afford have ingredients you never assumed were included or are questionable if not downright harmful (colorings, transfats etc) to your and your children’s health. This is why I would like to teach my children the attitude of a person with allergy: just because a corporation for profit making purposes produced this product and is in your immediate vicinity at all times is no reason for you to consume it. But of course as you rightly point out, industrial marketing does everything in their power to undermine that decision making and they do it very very well, and anybody who considers not to consume the junk has to have a positive experience with food they can create and a plan to carry that through every single time they want to eat or feed. So you have to stand up against the habitual way of obtaining food and popular culture in addition at all times. A tall order even if you are conscious and have sufficient resources, and I agree that it is fair to ask: How on earth did we get here? My own kids occasionally come up with something which provides reason for hope when I feel the outrage about the whole food environment situation. My best story happened a few years ago now. One day in school, after receiving a cupcake for celebration together with all the other kids, my six years old licked the topping, bit into it and left the cake there on the table. When the teacher asked him about not finishing it he said: Thank you, I do not like it, it is too sweet for my taste! To help parents navigate and raise healthy eaters in this environment is the whole motivation behind the Feeding Your Kids program.Thank you for your analysis and insight. Your blog is referenced in the program. Thanks Eszter and I had a similar experience with my youngest when we had fruit tarts for dessert on Easter. She ate the fruit and the filling but left the crust because it tasted too sweet for her. I took it as a good sign that we’re finding the right balance but also know it’s not over until she is a grown woman with a healthy relationship with food.